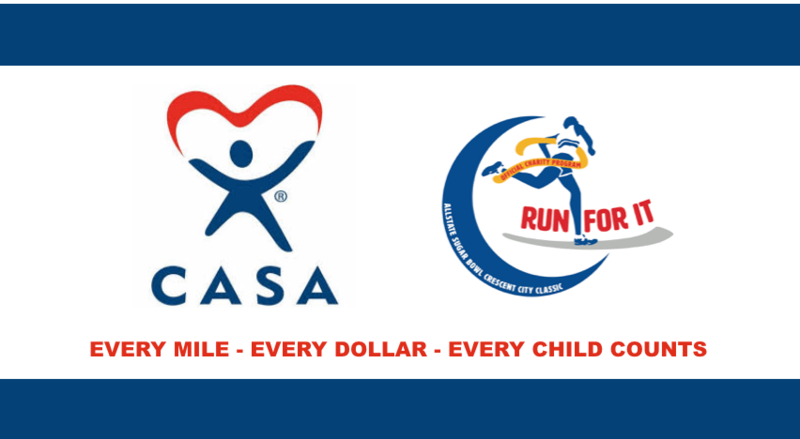 Join us in raising awareness and support for CASA Jefferson and to lift up the voices of children throughout our community who deserve safe, nurturing homes. By signing up, You help secure safe, permanent homes for abused and neglected children in our community. We believe every child deserves someone who has their best interest at heart and will speak up for them in the court room. Your decision to select CASA gives a child a voice and opportunity to thrive. Prime starting location on race day in the “Charity Corral” positioned directly behind Seeded Runners and Corral D.
Access to air-conditioned restrooms race morning in Champions Square. Prizes for the highest fundraiser. How do I run for FREE? There is a discounted registration fee of $40 for all charity runners. If the runner raises a minimum of $250, a $40 refund will automatically be applied to their credit card. Please note, the minimum requirement is to fundraise $200. Participants will agree to raise $200 and will receive a unique donation page that can be shared through multiple outlets including Facebook and email. To volunteer for this even, you can easily register for the starting line positions by simply filling out his/her first name, last name, and emergency contact information. Once you have created his/her profile, you will automatically be placed in the appropriate role and be eligible for further communication by the Sports Foundation. That is it! Closer to the event, Crescent City will communicate all volunteer logistics with each volunteer directly. Thank you Crescent City Classic for allowing CASA Jefferson, Inc. to participate for the second year in this amazing event and your constant support for our foster youth!